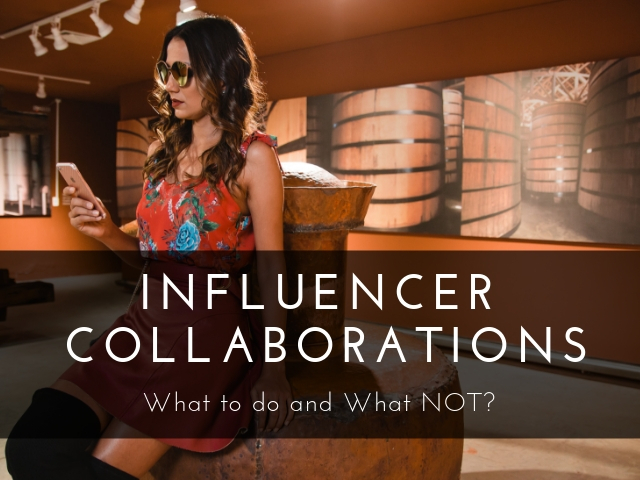 Influencer Collaborations: What to do and What NOT? Influencer Collaboration is becoming very important in the current era of digital marketing as it helps brands to reach its potential customers in any niche across geographical discriminations. Influencers are people who are powerful on social media and who are capable of taking a brand to the end audience by posting powerful content about the brand on their social media pages. There are a number of influencer collaborations and campaigns that inspire both brands and influences to leverage on their digital marketing strategy. The first step in this initiative is to frame a list of social media influencers who would really help the brand to grow and would take it to the prospective clients. The influencer should have an optimal audience base that matches the niche of the business. The influencer should be communicated clearly on the business strategy and on what is expected out of the collaboration. The influencer should know the objectives of the brand clearly and his expected deliverables. The influencer has to be helped in creating creative content that mimics the brand exactly as it is. There are some don’ts pertaining to influencer collaborations, the brands should not judge the influence of the influencer based on his social following statistics. Brands have to look out for the actual engagement of the social media influencer based on his number of comments, likes, and shares. Influencers should not be expected to change their business overnight, as luck plays a major part in defining the success of influencer collaborations. Many influencers could be employed to work on a campaign together for a sure success. Brands should not limit the creativity of the influencers they hire. Their followers get influenced by the genuine recommendations they advocate. So influencers should not be forced to create content based on the strict requirements of the campaign. Brands should not delay in offering creative assets for influencers to prepare the content as delaying would prompt last-minute content creation and the campaign would be a failure. Creating a unique discount code for the collaborators would help them share the content to a great extent and drive sales for the brand ultimately. If the goal of the campaign is to amplify sales and convert leads into customers, then the influencer marketing campaign should be based on the incentive to purchase. Offering unique discounts that are too good to refuse will help encourage consumers to make a purchase immediately and out of impulse. Another way to drive sales is through affiliate marketing. Affiliate marketing is where the influencer would gain a commission on all the sales that is been generated as a result of his influence among the prospects. This seems to be one of the best ways to track the return on investment of the influencer campaigns and also encourages the influencer to support the product actively, as his earnings are based on his promotions. For those brands, where brand awareness is the priority compared to sales, the best way to collaborate with the influence is through conducting contests and offering products from the brand as prizes. The influencer could either conduct the competition or he could promote the competition that is been performed by an online business through links for the website being posted in his content. This initiative helps in engaging the brand and the target market, and the brand has to be specific in whom to allow participating in the contests. Contests and competitions would enhance the followers in the social media, improves the email marketing list and help in gaining data pertaining to consumers, to take competitive advantage of the rivals. Long term partnership goals are always beneficial for both the brand and the influencer. Being the brand ambassador of the brand helps them to attach their name with the brand and enhance the brand loyalty of his followers indirectly. Long term partnerships have the potential to drive serious ROI for the brands as well. Posting product reviews on the social media pages on the influencers could be a huge hit in leveraging a special place for the brand. But the strategy should be handled with care, as a PR stunt could create a false hype of a fear of the brand being swiped out. Using the simple message from the brand as the backbone of the Influencer’s ordinary post could be extremely powerful, as it creates an emotional impact on the minds of the influencer’s followers. This, in turn, creates an emotional bond with the brand and the product as well. For instance, the simple post of the influencer, planting trees could have the background message pertaining to a brand with real estate niche. The problem with influencer marketing through pictures and poses is that it could pose to be dull quite easily; the same was the problem with billboard advertising as well. Challenge collaboration takes the product from its store directly to the doorsteps of its prospects calling for a strong call to action. For instance, challenging the influencer to complete the entire pack of a bottled drink and posting them on their wall would perpetuate his followers also to do the same, the sale of the product is also enhanced. It has been proved in the past that the sales of the products that have been challenged on social media have improved sales than the products that were simply bragged upon. Takeover collaboration pertains to having influencer leverage on the social media account of a brand for a brief period of time. This could either be a complete takeover or a semi takeover, where the influence logs into the social account of the brand and posts during a speculated timeframe. They will warm up the followers by offering an early notice that they would be a virtual guest on the account of the brand. Here the influencer trusts the brand and behaves as an excellent advocate for the brand and its accounts. Influencer inspired collections are new types of Collaboration that require extreme commitment from both the brand and the influencer. In this type, influencers behave as co-creators of the products of the brand and not just its promoters. For instance, a renowned lipstick brand creates new lipstick shades based on the preferences of its influencers. Influencer curated collections would hold a place in their list of favorites and allows his audience to directly shop from this favorites list. However, in this method, influencers are to be given a special discount or a coupon code to give out to their audience to enhance promotions of the brand. Hosting events on behalf of the brand and inviting influencers to be a part of the event would impact them personally and would offer them an event to post on their walls. The event has to be centered on a message or an announcement on behalf of the brand so that when the influencer posts about it, the message is conveyed to the larger audience. Meetings can be organized by teaming up with other local businesses or other e-commerce store owners, so as to keep the cost of hosting the event low. Through this collaboration, influencers would share a heartfelt story and not a quick review of why they promote that product. The influencer is able to attach a personal memory line to the brand that inspires him, but brands are to be careful in choosing an influencer who is vulnerable to getting close to the brand emotionally. Here, the brands have to support their influencers and encourage them through frequent emails, comment on their posts positively and connect with their audience. Most of the brands are quite aware of when to host a discount sale or a sponsored sale around festivals. Offering a sale or a time-limited discount through influencers is the best way to bypass the customer bargains and still reach the end audience better. Offering a flash sale for a limited time period through influencers, would surely benefit the interaction between both the parties and engage consumers ultimately. For brands that have no budget constraints and has a creating strategy on influencer marketing, that brand could make the influencer the part of its team. Rather than working on an external resource, the brand could make the influencer the part of its internal team and create a unique role for them in their business. They could be treated as marketing advisor, creative marketer, product designer or a digital consultant so as to utilize their potential to the fullest for the advantage of the business. This type of collaborations enhances the brand influencer relationship and would also attract the attention of consumers, enhancing the authentic promotion of the products. Public relations professionals look up to influencers to support their marketing campaigns and the relationship is true on the reverse as well. Following the PR strategy for social marketing would help to enhance brand awareness and would positively change the perception of the brand. Budget ads are one of the finest influencer collaboration strategies that would hold good for brands with a limited budget and for brands that are on the testing phase, evaluating the best fit influencers for their brand. Banner ads are an important mode of revenue generation for bloggers, social media marketing experts, and influencers. This traditional method has lost a bit of its significance after the introduction of motion pictures and videos for brand promotion. Influencer allows the brand to reach the target audience and enhance their engagement. The brands are infused on the minds of the target audience directly as creating partnerships works way better in this regard than booking an ad on a website or social platform. Brands need not worry about banner viewability as they are appending themselves to the creator’s contents. Brands are leveraging on the influencers who have authentic subject matter expertise and have actual talents in promoting the brand. Brands targets influencers to build relevance within a particular category. This relationship is forecasted as a marketing opportunity. Most of the brands buy an influencer based on the niche against their demographics. This allows brands to reach in-market relevant consumers as these customers are picked up from the audience to reach a relevant influencer. Most of the modern day influencers are visual content creators and storytellers, thus partnering with them offers the advantage of both media attention and delivery of the intended content creatively. The brands could control what the influencer might post about the brand, but they cannot control what they would post around that content, the safety of the brand becomes a concern here. A minor shortfall on the side of the influencer could impact the image of the brand extensively. There is a problem with fake followers as well; research reveals that most of the influencers have fake followers whom they pay to escalate their numbers. There are a number of influencer Collaboration techniques to choose from, but the best fit technique lies in the marketing goals of a business. The nature of the brand and its industry, what it wants to achieve, either sales improvement or brand awareness or consumer acquisition would decide on the best collaboration strategy to leverage on.